Adventureland and Workampers - a Win Win! The Adventureland Workamper program provides a free hook up campsite that includes your electric, water and sewer. Workampers, 18 years and older, are paid for all hours worked at the rate of $8.50/hour. There is no contract or time commitment, but working to the end of our operational season will result in an end of season bonus. Our program has become a Win-Win for Adventureland and the Workamper!! Adventureland Park is an outdoor amusement facility. 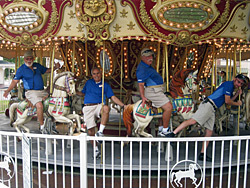 Our Workampers primarily work in the amusement park. 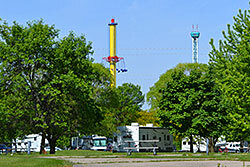 In addition to the amusement park, there is a 187 room hotel and a 310 site campground spread over 200+ acres. We are located just east of Des Moines in Altoona, IA right off I-80 exit 142. We expect to provide entertainment for over 600,000 guests for the 2019 season. 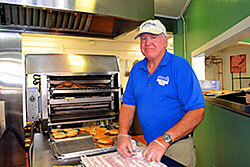 Adventureland Park is open beginning with part time weekend only operations the last weekend of April. Full time daily operations run from mid-May to mid-August. The operational season returns to part time weekend only until the last weekend of September. Free FHU Site, Pay for All Hours and End of Season Bonus! 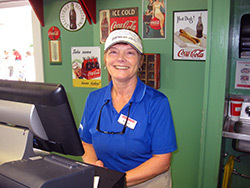 Duties include taking food orders from guests, filling orders, accomplishing a cash transaction with or without a cash register, and preparation of food items. Lifting requirements include receiving and unpacking inventory and daily lifting of food items. Safety requirements include use of personal protective equipment for chemical hazards, proper safety attire and following all other company safety requirements. 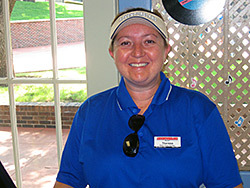 Duties include working in one of many games or arcades located throughout the park. Responsibilities include, but are not limited to cash handling, walking, standing, moderate lifting, prize issuance and player encouragement including microphone usage. Basic math skills and an outgoing personality are required. Games are located in both covered and uncovered facilities exposed to various weather elements. Employees should be prepared for a very active working environment with a high volume of guest interaction. 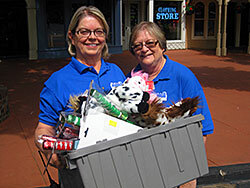 Duties include working in one of many souvenir shops or kiosks in the park and waterpark. Responsibilities include, but are not limited to using point of sale computers, cash registers and credit card machines, stocking stores, light cleaning, moderate lifting, standing and walking during your entire shift. Stores and kiosks include both indoor and outdoor facilities exposed to various weather conditions. 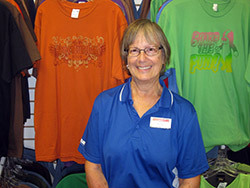 Employees should be prepared for a fast paced, high volume and highly active retail environment. 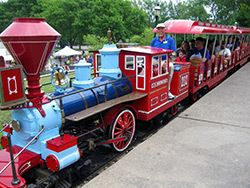 Duties include operating and/or assisting on various amusement park rides. 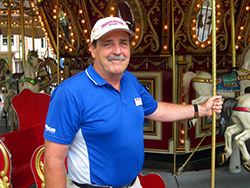 Responsibilities include not only operating rides, but also assisting guests during the loading and unloading process and ensuring guest safety. These positions involve being on your feet for extended periods of time, requires mobility and moderate lifting. You will be exposed to various weather conditions and have constant guest contact. You need to be aware that all of our positions require you to be on your feet working. Many positions require that you work outside. Positions available April through September! During weekend operations – late April to mid-May and mid-August to late September: Be available to work Saturday and Sunday. During full-time daily operations – mid-May to mid-August: Work up to 8 hours/day and up to 6 days/week. You may expect to be scheduled up to 40 hours/week. Adventureland does not require you to commit to any length of time for Workamper employment, but working to the end of our operational season, will result in end of season bonuses. We have a dress code that we ask all of our employees to follow. Adventureland works at developing a clean, well-kept appearance. Hair cannot extend below the shirt collar. Men may have a fully grown in, well-maintained mustache, beard or goatee. If hair length is longer than shoulder length it must be tied back, and conservative use of make-up is required. If you have specific questions about dress code please ask when calling or writing to us. Workampers, 18 years and older, are paid for all hours worked at the rate of $8.50/hour. As long as you’re employed as a Workamper at Adventureland, you will receive, as a condition of your employment, a free campsite with water, sewer and electricity included. 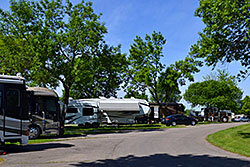 We have a beautiful five star rated campground with the following: Picnic tables, coin operated laundry facilities, comfort stations with showers, outdoor pool, free wireless internet in common areas, a new dog run in the center of the campgrounds and all within easy walking distance to the amusement park. As an incentive to complete the season, we will calculate your total hours and pay an additional $.75 for every hour worked if you complete the season AND an additional bonus of $400/campsite. Please Note: To receive the additional $400 bonus/campsite, the majority of the occupants of a campsite must be working at Adventureland at the end of the season and worked more than 50% of the operational days of the season. There are no contracts, no obligations, no penalties, and no small print. We are that confident that you will love our program. We will be completely honest with you about your job expectations and its benefits. There will be several planned activities for our employees. 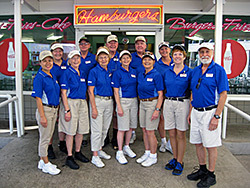 Trips to area attractions, movie night, BINGO night, ice cream socials, contests, golf outings, and much more. You will also have free park entrance for a large portion of the season. There will also be discounted tickets available for your family and friends who come to visit Adventureland. Two shirts will be provided at no cost along with a sweatshirt and raincoat. There will be a $15 uniform deposit taken out of your first pay. After you return all issued clothing at the end of the season, the $15 will be refunded on your last pay. Additional shirts may be purchased at a minimal cost. Employees are responsible for the following: Low cut black or white athletic style shoes; khaki shorts, pants, or capri pants (women only); black belt with the black shoes or brown belt with white shoes. State Capitol, Blank Park Zoo, Iowa Cubs AAA Baseball, Science Center, Iowa State Fair, Living History Farms, Botanical Center, Art Center, Prairie Meadows Horse Race Track and Casino, Two Rivers Art Festival, Farmers Markets, Four Major Malls, Numerous Golf Courses, Theatres. Amana Colonies (German Community), Hot Air Balloon Festival (Indianola), Knoxville Raceway (Sprint Car Nationals), Iowa Motor Speedway (Newton), Tulip Festival (Pella), Bridges of Madison County (Winterset), Reiman Gardens (Iowa State University Campus in Ames). 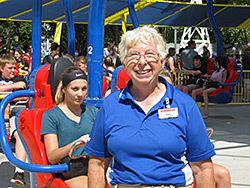 Adventureland Amusement Park is a Featured Employer with Workamper News, Inc.
All photos and text on this page are property of Adventureland and may not be used without their consent.